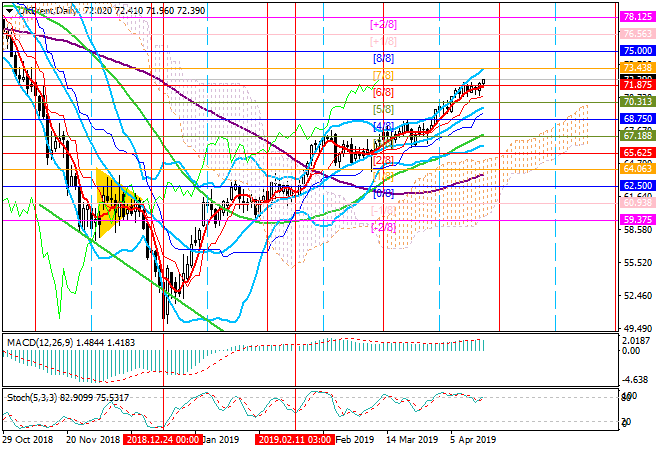 Oil prices rose markedly on April 22, supported by the US intention to impose sanctions on countries that import oil from Iran. 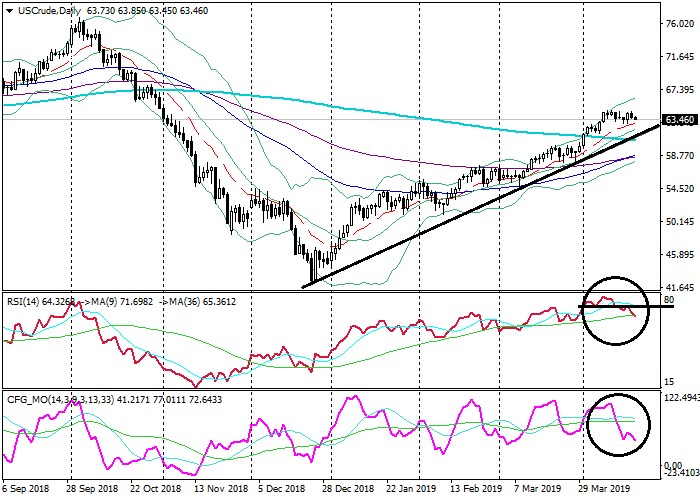 Now for a number of countries, there is an exception that allows them to buy Iranian oil, but starting from May 2, this possibility will disappear, which threatens with an acute shortage in the market or new trade conflicts. 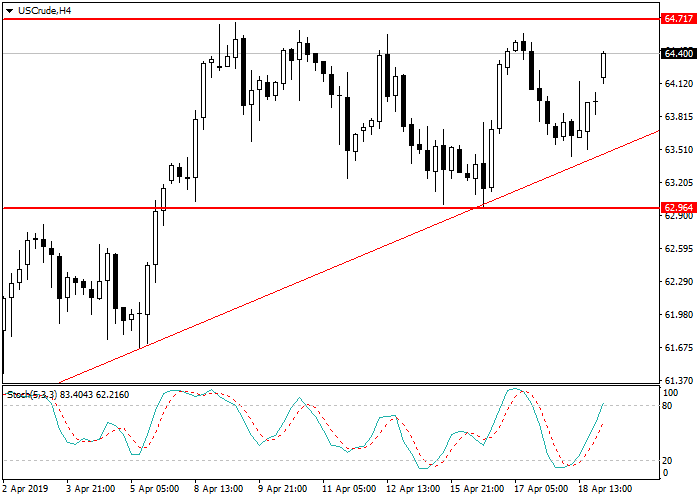 Oil continues to trade within an upward trend. On the 4-hour chart, a “Triangle” figure was formed with the upper limit at 64.71. In the case of its breakout, the next target will be 66.80. Yesterday, oil prices rose, supported by the same factors on the market. The report by the US Department of Energy reflected a steady decline in US oil reserves by 1.4 million barrels, and also recorded a slight decrease in the volume of “black gold” production in the country. 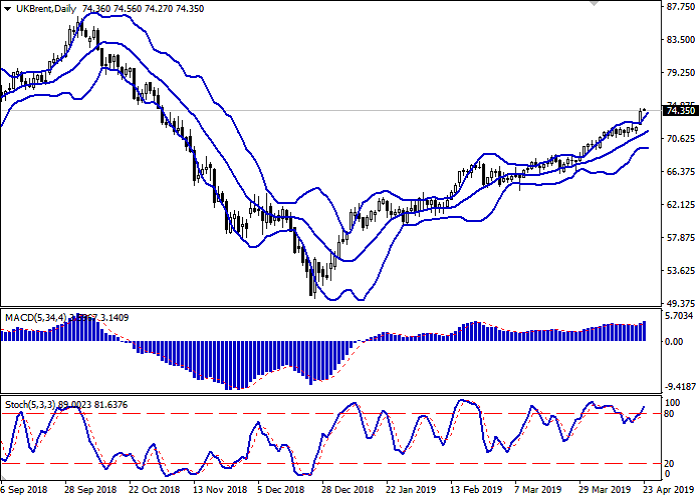 On the 4-hour chart, the instrument is trading in the lower Bollinger band. The price remains above the EMA65, EMA130 and SMA200 that are directed up. The RSI is approaching the border of the oversold zone. The Composite is falling as well, having broken down its longer MA. Oil quotes are growing within a four-month uptrend. Long-term support factors remain the same and include a reduction in production by OPEC+ countries, a decrease in supplies from Iran and Venezuela due to US sanctions and fighting in Libya, which threatens oil supplies to and from this country.